As the year 2012 comes to close, we thought it would be fun to revisit some of our favorite wedding dresses and accessories from the past year. If you fall in love with one of the dresses or veils below, we have a New Year’s gift for you! All the wedding dresses featured below with be 10% off during the weekend of January 11th-13th at Blue Bridal’s Denver location! The first dress is a Tara Keely by Lazaro featuring ivory Mikado organza in a trumpet shape, with pleated bodice, a gorgeous beaded belt at the waist, and wave ruffle skirt with sweep train. A simple, yet stunning Sara Gabriel feather flower hair pin in the perfect accompaniment to this gorgeous wedding dress! The next gown is an ivory Alencon lace bridal dress with strapless sweetheart neckline and elongated bodice, horsehair belt at natural waist, three tiered tulle skirt with horsehair trim and chapel train by Tara Keely. The veil that pairs perfectly with this dress is one of our all-time favorite veils, the Phoebe veil by local designer Sara Gabriel. 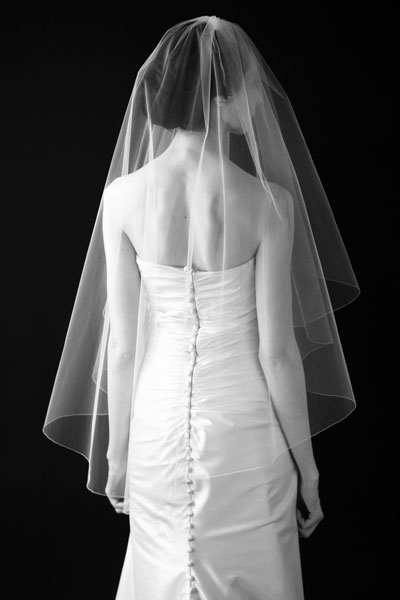 Normally reserved for garment construction, horsehair looks ahh-mazing as a trim and helps the veil hold its shape. Bonus: It coordinates perfectly with the horsehair trim on the bottom layers of this Tara Keely dress! Our next set of favorites comes to us from the hottest new designer there is, Hayley Paige. This beautiful bridal gown has a casual elegance with it’s slim silhouette in ivory silk georgette with Grecian draping. This beautiful wedding dress also features lovely crystal floral beaded straps and crisscross tulle detailing at center back with chapel train. We adore this style paired with the Sara Gabriel Bernadette clip which features SWAROVSKI® crystals in a filigree styled brooch! One of our favorite wedding dresses of the year is this simple, yet stunning ivory mikado bridal ball gown with accentuated cinched waist, beaded crossover straps and chapel train from Jim Hjelm Blush. So simple, yet so elegant with just enough delicate beading detail to make this a “wow,” dress that is lightweight and comfortable! This dress pairs perfectly with the Sara Gabriel Natalie clip featuring gracefully swirling loops of horsehair ribbon. 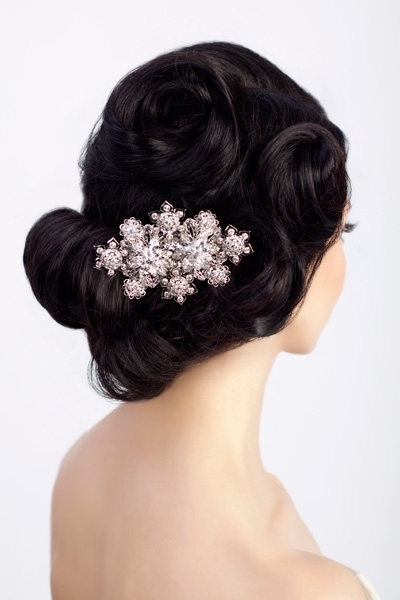 This beautiful little hair clip is the perfect compliment to this dress as well as almost any style. 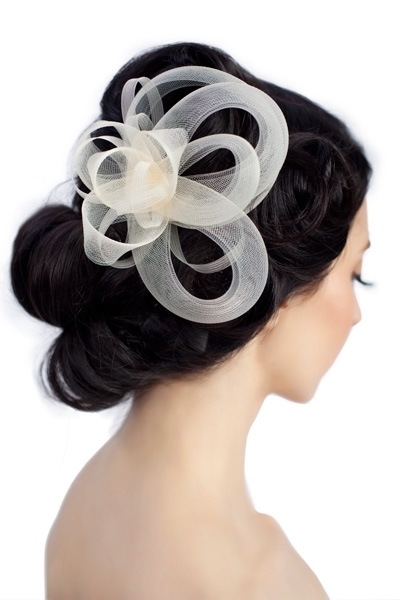 Wear it in the front like a hat, or further back on your head and it almost looks like a flower! If you’re looking for a ball-gown style dress that people will be talking about long after your wedding, this Tara Keely silk organza and tulle bridal ballgown is your dress! Strapless sweetheart, hand draped silk organza bodice with chapel train with an optional organza and horse hair origami belt, this dress is one to be remembered. This stunning wedding dress pairs perfectly with a simple veil such as the Sara Gabriel Tia veil with an elegant petal cut and understated pencil trim edge. This Tara Keely Alencon lace mini dress, with moire ribbon at natural waist, tulle over-skirt with horsehair accented hem and chapel train is two dresses in one! If you are looking for a dramatic ball gown style to wear for your ceremony but want a lightweight party dress for your reception without having to change clothes, this is your dress! 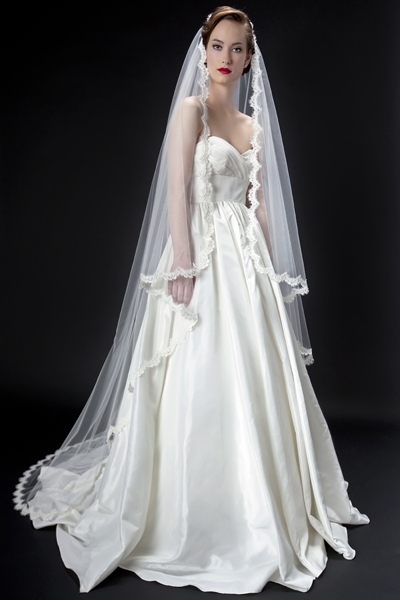 For an elegant lace veil to wear during your wedding, the Sara Gabriel Rae veil is a great veil and a great price!